Perhaps no twentieth-century artist utilized puns and linguistic ambiguity with greater effect—and greater controversy—than Marcel Duchamp. Through a careful "unpacking" of his major works, Dalia Judovitz finds that Duchamp may well have the last laugh. She examines how he interpreted notions of mechanical reproduction in order to redefine the meaning and value of the art object, the artist, and artistic production. Judovitz begins with Duchamp's supposed abandonment of painting and his subsequent return to material that mimics art without being readily classifiable as such. Her book questions his paradoxical renunciation of pictorial and artistic conventions while continuing to evoke and speculatively draw upon them. She offers insightful analyses of his major works including The Large Glass, Fountain and Given 1) the waterfall, 2) the illuminating gas. 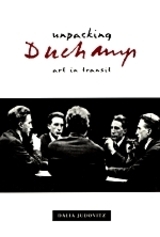 Duchamp, a poser and solver of problems, occupied himself with issues of genre, gender, and representation. His puns, double entendres, and word games become poetic machines, all part of his intellectual quest for the very limits of nature, culture, and perception. Judovitz demonstrates how Duchamp's redefinition of artistic modes of production through reproduction opens up modernism to more speculative explorations, while clearing the ground for the aesthetic of appropriation central to postmodernism. Dalia Judovitz is Professor and Chair in the Department of French and Italian at Emory University. She is author of Subjectivity and Representation in Descartes: The Origins of Modernity (1988) and coeditor of Dialectic and Narrative (1993).